Coats' disease is a disease of childhood, which is characterized by retinal telangiectasia and massive retinal exudation leading to exudative retinal detachment and may present as leukocoria. In adults, it presents with localized exudation, telangiectasia, and hemorrhages. The visual acuity is usually not much affected unless exudation involves the macula, which requires treatment. Therapeutic options include laser photocoagulation, antivascular endothelial growth factor (anti-VEGF) injections, cryotherapy, surgical treatment of exudative retinal detachment, and enucleation. A 33-year-old male presented with complaints of defective vision in the left eye for the past 2 weeks. There was no history of trauma. There was no similar complaint in the past. The patient did not have a history of systemic diseases such as diabetes, hypertension, tuberculosis, and connective tissue disorders. His general and systemic examinations were within normal limits. Blood pressure was 130/80 mmHg. Best-corrected visual acuity in the right eye was 6/9 with –0.50DS 6/6 and in the left eye was 6/36 with + 1.5Dcyl at 100 degrees 6/12. Anterior segment examination was normal in both eyes. Intraocular pressure was 12 mmHg in both eyes. Pupillary reaction, color vision, fields, and orthoptic evaluation were normal in both eyes. Fundus examination of the right eye showed a clear media, normal disc and vessels, and the presence of foveal reflex [Figure 1]. Fundus examination of the left eye showed a clear media, normal disc, and localized lipid exudation temporal to fovea. Vessels over the exudation were found to be dilated and telangiectatic. Few hemorrhages were noted over the surface of the exudation [Figure 2] and [Figure 3]. Fundus fluorescein angiography revealed normal study in the right eye. 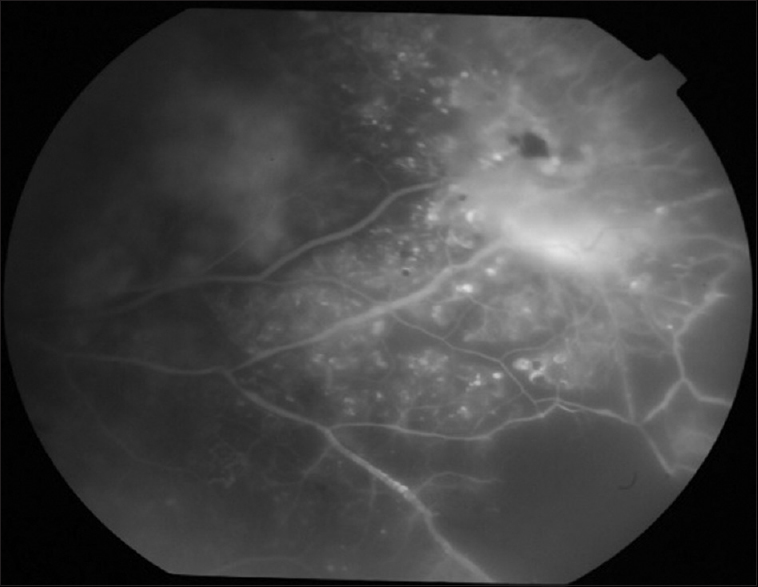 Abnormal “light bulb dilatations” of large retinal vessels, capillary telangiectasia with extensive leak, and adjacent capillary nonperfusion areas (sparing the macula) were noted at the same area in the left eye [Figure 4] and [Figure 5]. 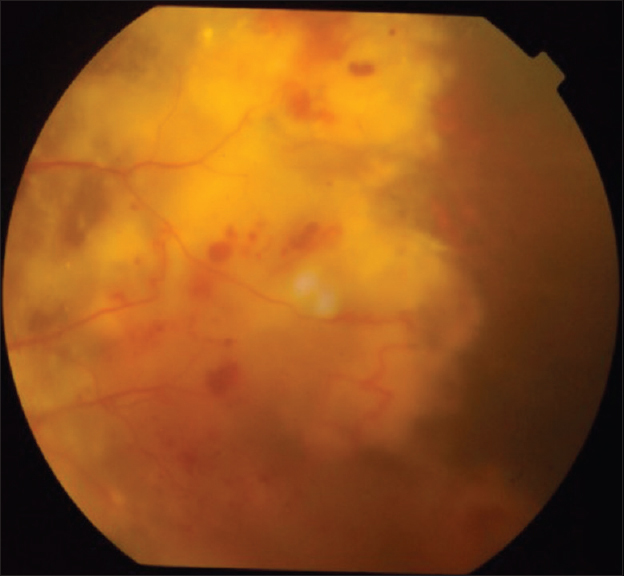 The patient was treated with intravitreal anti-VEGF injections followed by sectoral retinal photocoagulation [Figure 6] and [Figure 7]. The patient's best-corrected visual acuity after 4 weeks of treatment was 6/9. Coats' disease was first described by George Coats in 1908. It is an idiopathic, unilateral, and progressive exudative retinal vasculopathy characterized by telangiectasia, aneurysms, and abnormal dilatations of retinal vessels. It has wide clinical spectrum ranging from isolated vascular anomalies with no or minimal exudation to extensive intra- and subretinal exudation and generalized lipid deposit. Although Coats' disease can present at any age, the majority of cases are diagnosed in the first two decades of life. Coats' disease in adults presents unilaterally with male preponderance, similar to childhood-onset Coats' disease. Adult onset Coats' disease differs from that of childhood onset in that many adult patients have no symptoms and may have good visual acuity; it is slowly progressive; the vascular anomalies generally appear in the equatorial and peripheral retina with localized lipid exudation (which appear in a massive but diffuse manner in children); and is associated with more retinal hemorrhages due to bleeding from aneurysmal vessels. 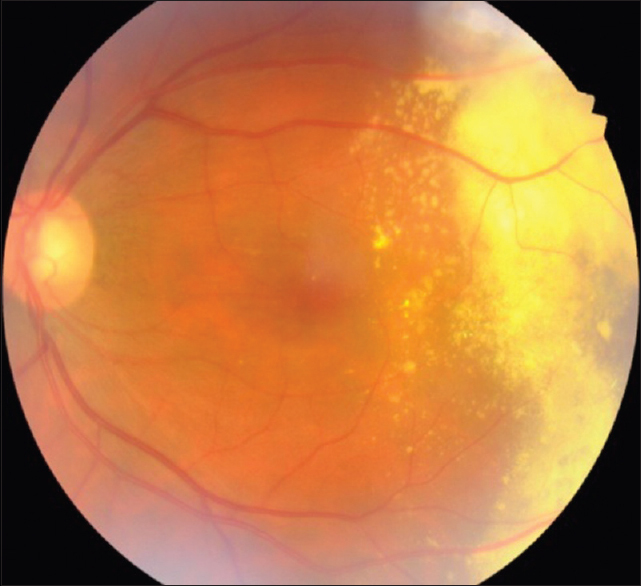 Coats' disease is diagnosed mainly by fundus examination and fundus fluorescein angiography. Fundus examination shows telangiectasia and aneurysmal dilatations of retinal vessels with localized intra- and subretinal exudation. 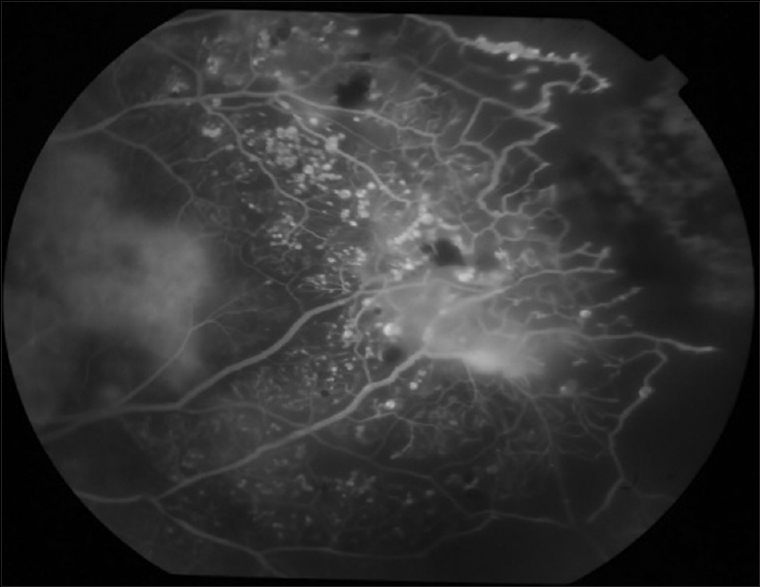 Fundus fluorescein angiography shows telangiectasia, typical “light bulb” aneurysmal dilatation of the vessels, and capillary nonperfusion areas. The most important disease to be differentiated from Coats' disease in children is retinoblastoma. In adult patients, the differential diagnosis includes retinal detachment, toxocariasis, choroidal melanoma, retinitis due to cytomegalovirus, or toxoplasmosis. Adult patients usually maintain a stable visual acuity. Vision loss in adult Coats' disease is rare but can occur through macular edema and exudates, development of an epiretinal membrane, and foveal ischemia. The goal of treatment in adult-onset Coats' is to obliterate telangiectasia and to facilitate the reabsorption of exudates, thereby maintaining as much visual acuity as possible. Possible therapeutic options described in the literature include observation, laser photocoagulation, cryotherapy, surgical treatment of exudative retinal detachment, and enucleation.,,,,, Recent studies have shown promising evidence with the use of intravitreal anti-VEGF.,,,, Since the disease usually runs a benign clinical course in adults, treatment can be considered if the exudates threaten macula. 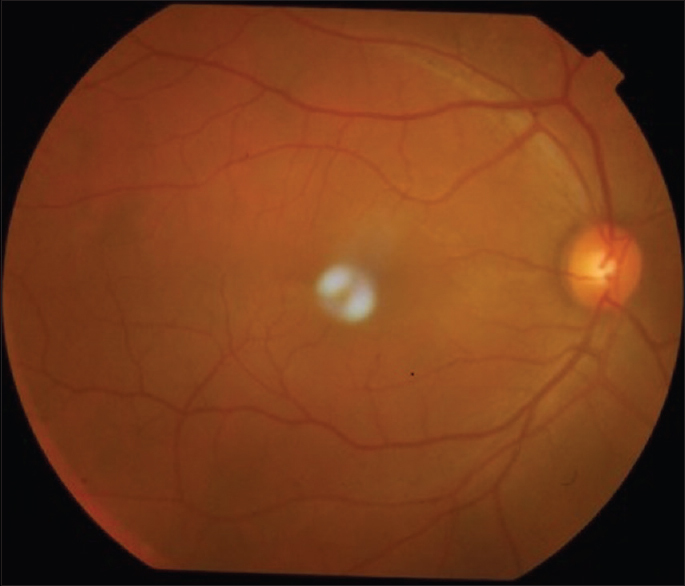 Although Coats' disease is primarily a disease of childhood, we must consider its diagnosis in adult patients exhibiting a retinal vasculopathy with prominent localized exudation. Usually adult-onset Coats' disease tends to follow a benign course. But treatment should not be delayed if there is risk of macular involvement. Timely treatment with laser photocoagulation can provide a very good visual outcome, with near-total to total restoration or preservation of vision. Otani T, Yasuda K, Aizawa N, Sakai F, Nakazawa T, Shimura M, et al. Over 10 years follow-up of Coats' disease in adulthood. Clin Ophthalmol 2011;5:1729-32. Dhawan B, Goel A, Singh R, Vig V. Adult onset Coats' disease in a 56-year-old male: An atypical presentation. Med J DY Patil Univ 2015;8:350. Smithen LM, Brown GC, Brucker AJ, Yannuzzi LA, Klais CM, Spaide RF, et al. Coats' disease diagnosed in adulthood. Ophthalmology 2005;112:1072-8. Koh YT, Sanjay S. Successful outcome of adult-onset Coats' disease following retinal laser photocoagulation. Oman J Ophthalmol 2013;6:206-7. Beselga D, Campos A, Mendes S, Carvalheira F, Castro M, Castanheira D, et al. Refractory Coats' disease of adult onset. Case Rep Ophthalmol 2012;3:118-22. Goel N, Kumar V, Seth A, Raina UK, Ghosh B. Role of intravitreal bevacizumab in adult onset Coats' disease. Int Ophthalmol 2011;31:183-90. Kim J, Park KH, Woo SJ. Combined photodynamic therapy and intravitreal bevacizumab injection for the treatment of adult Coats' disease: A case report. Korean J Ophthalmol 2010;24:374-6. Wang KY, Cheng CK. 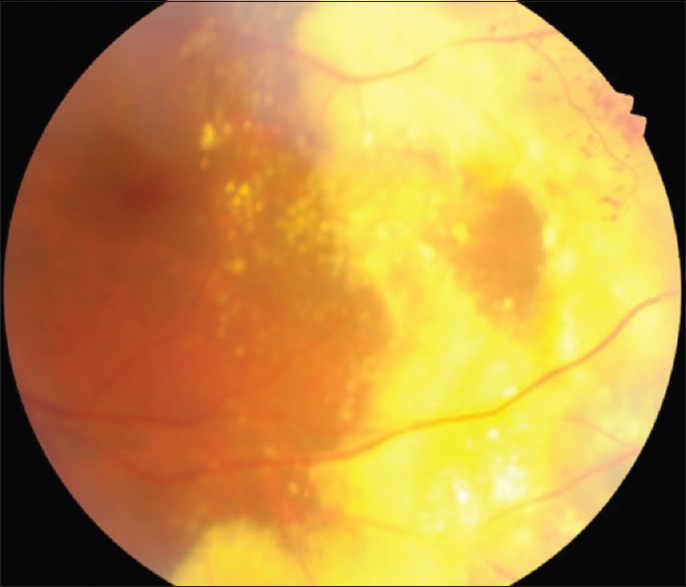 A combination of intravitreal bevacizumab injection with tunable argon yellow laser photocoagulation as a treatment for adult-onset Coats' disease. J Ocul Pharmacol Ther 2011;27:525-30. Raoof N, Quhill F. Successful use of intravitreal bevacizumab and Pascal laser photocoagulation in the management of adult Coats' disease. Middle East Afr J Ophthalmol 2013;20:256-8. Mino A, Mitamura Y, Katome T, Semba K, Egawa M, Naito T, et al. 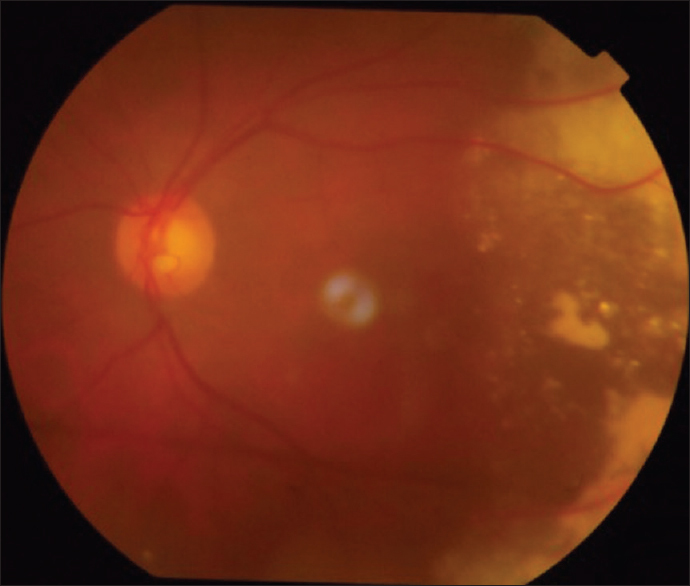 Case of adult-onset Coats' disease with epiretinal membrane treated with 25-gauge pars plana vitrectomy. J Med Invest 2015;62:85-8.